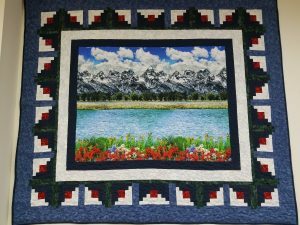 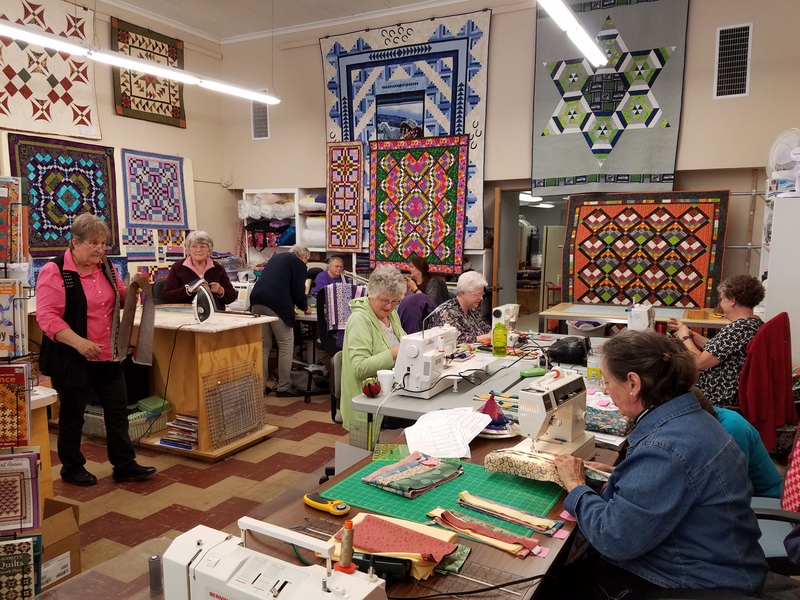 In late October, I drove across the mountains to Eastern Washington to teach at the North Central Washington Quilt Guild in Wenatchee. 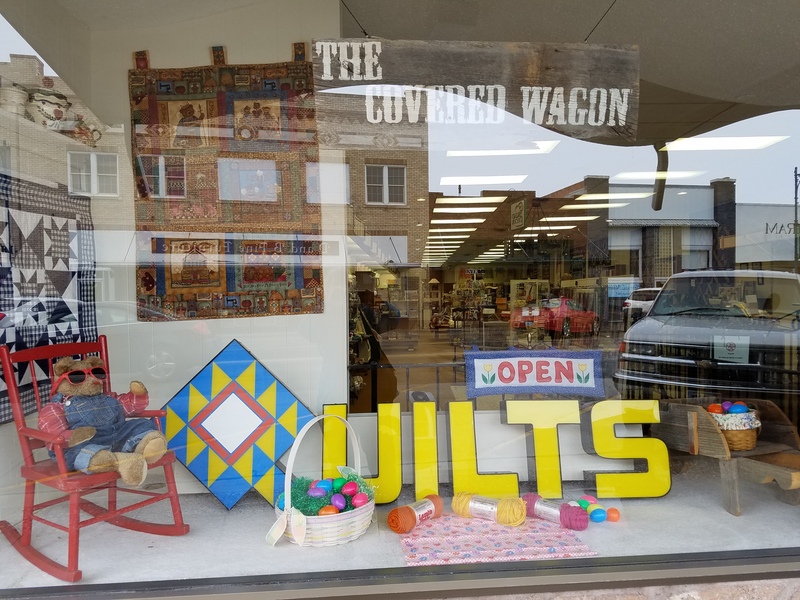 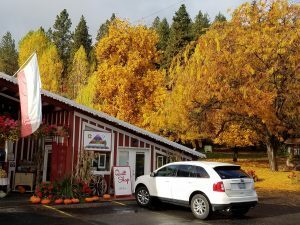 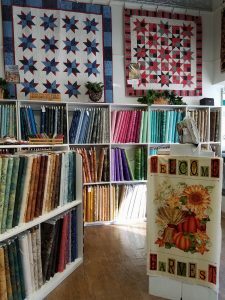 I came home via Highway 2 through the picturesque town of Leavenworth, stopping on the east side of town at this delightful quilt store, (11007 Highway 2, Leavenworth). 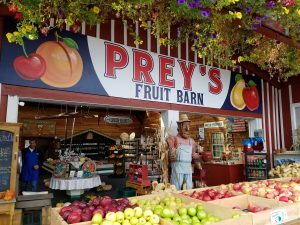 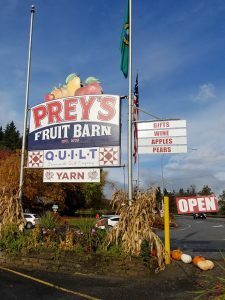 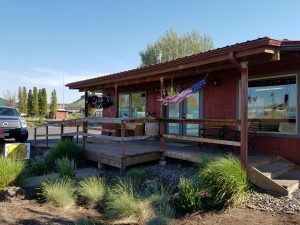 What a perfect combination – a quilt store and a local fresh fruit stand! 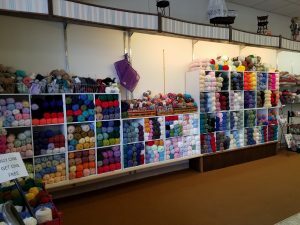 There’s also a yarn shop. 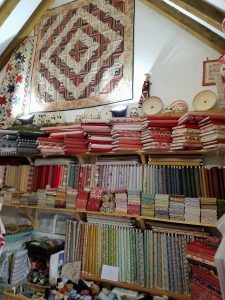 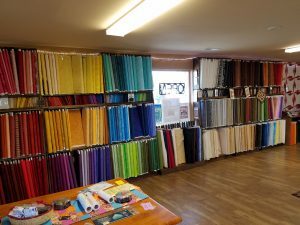 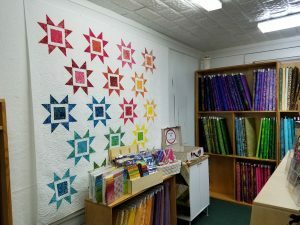 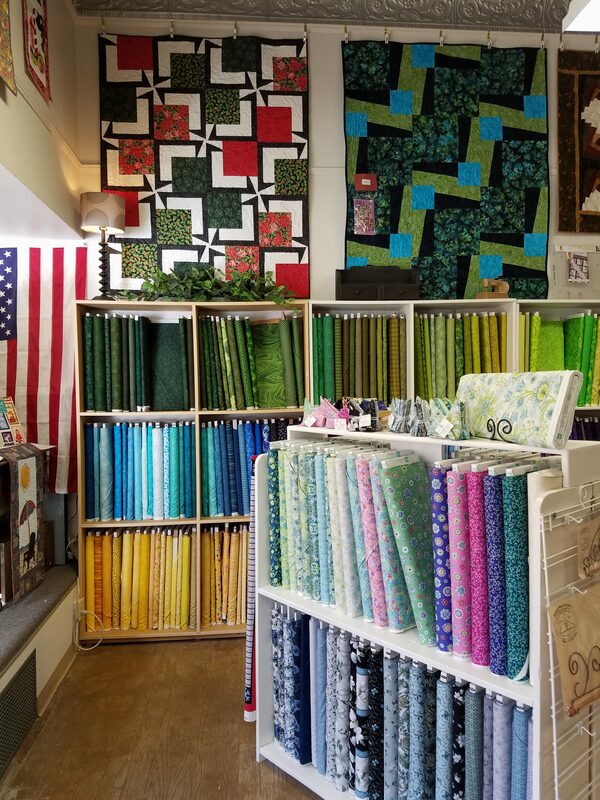 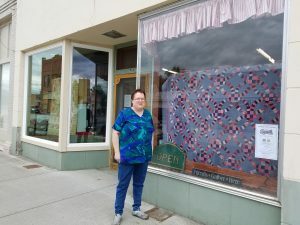 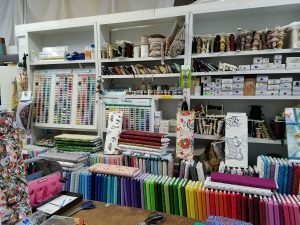 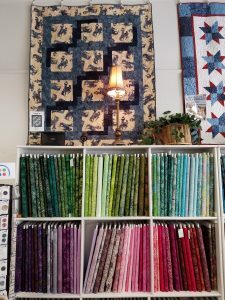 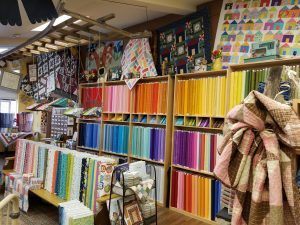 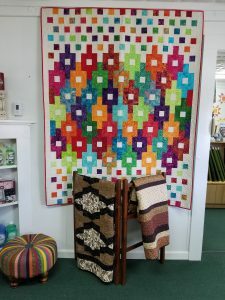 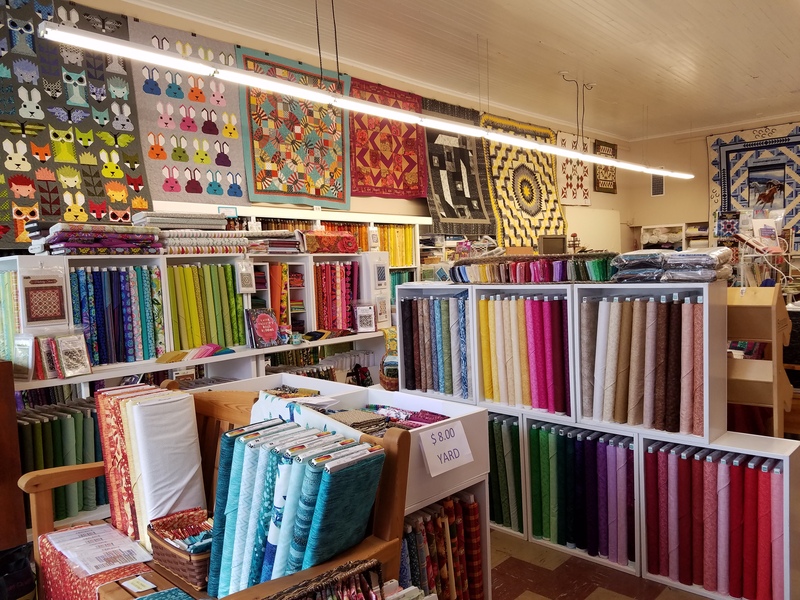 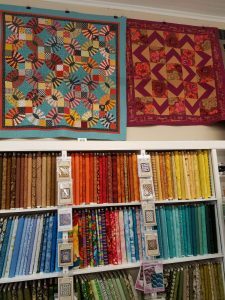 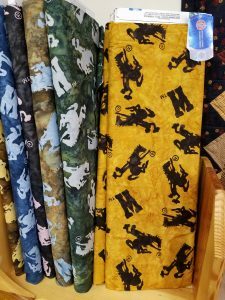 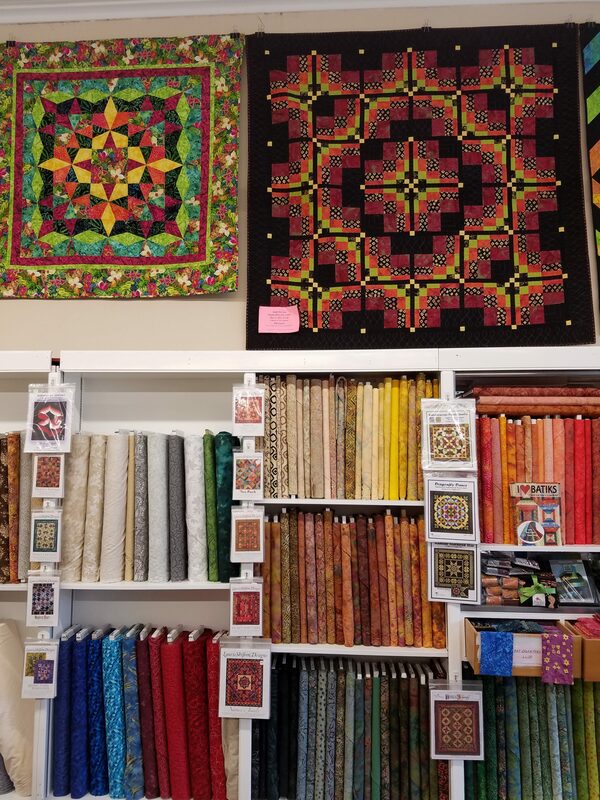 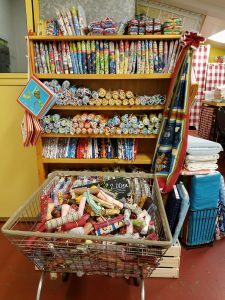 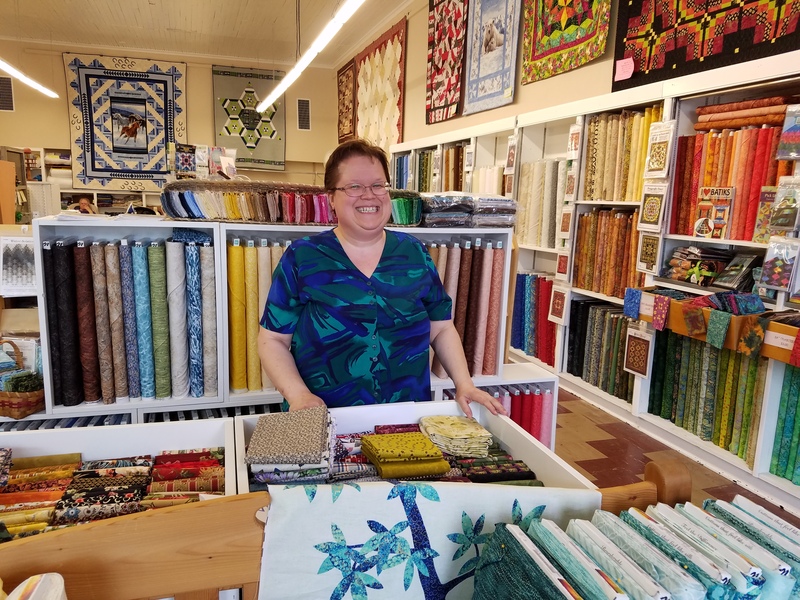 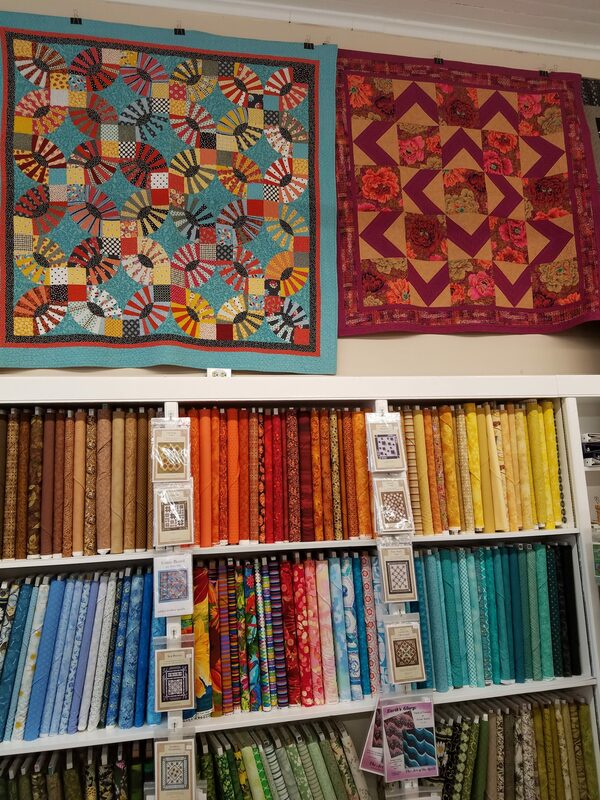 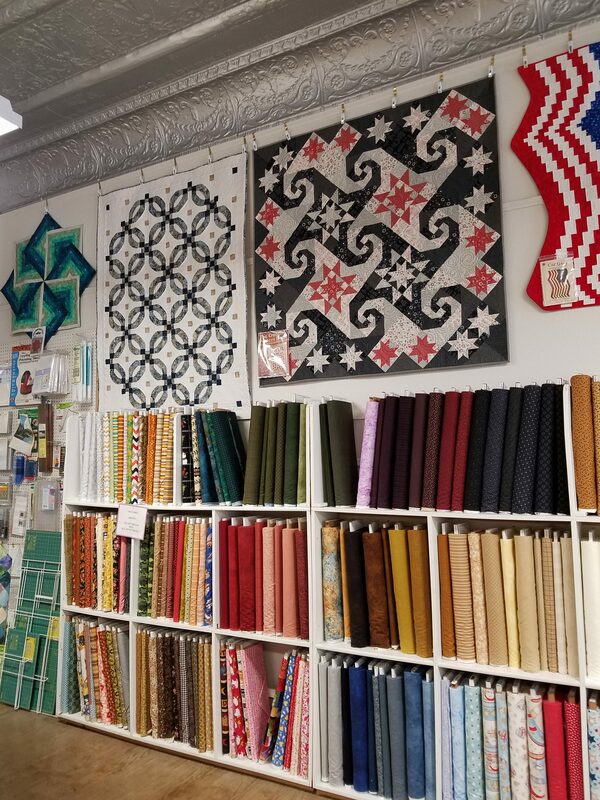 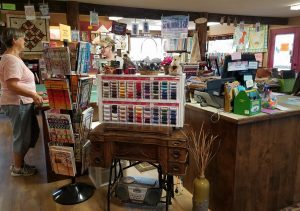 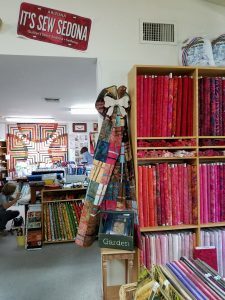 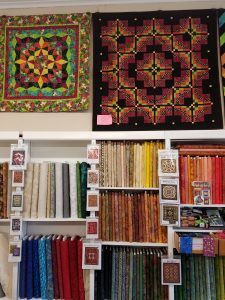 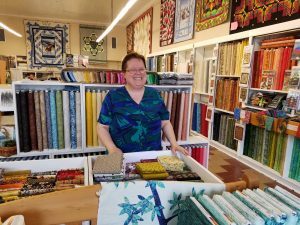 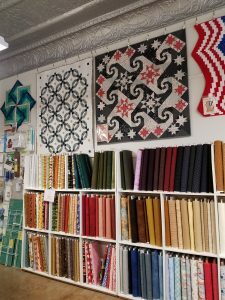 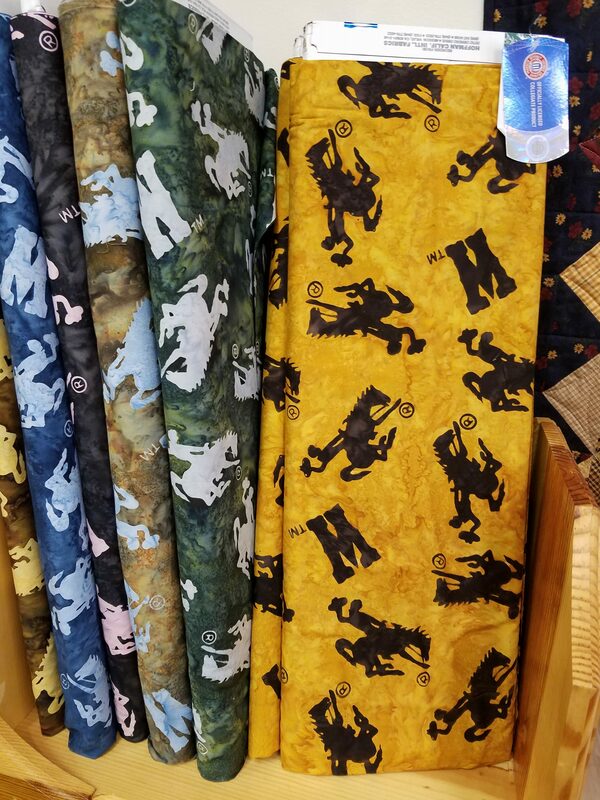 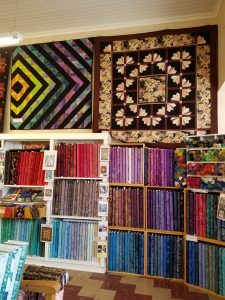 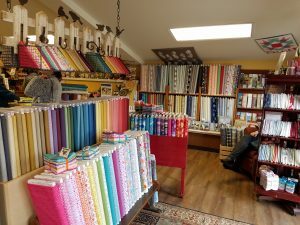 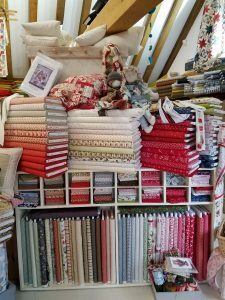 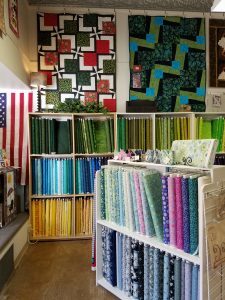 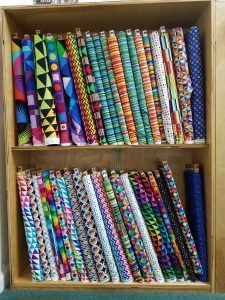 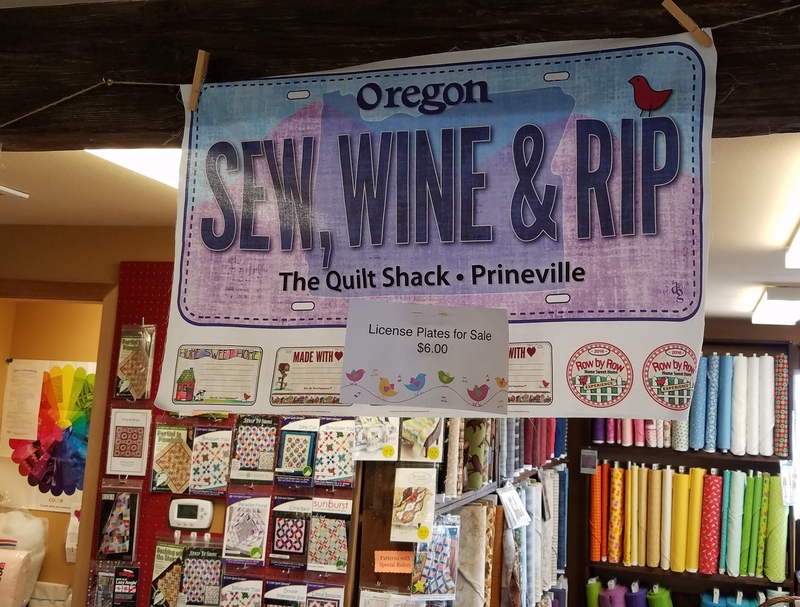 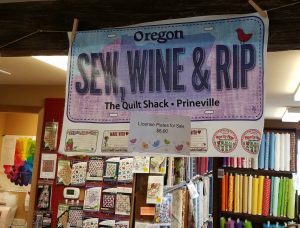 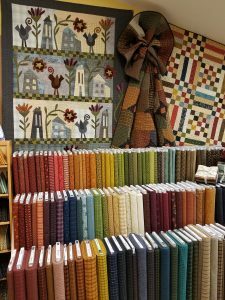 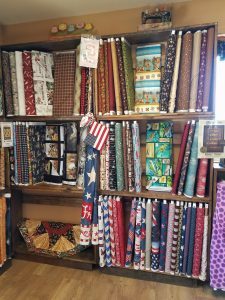 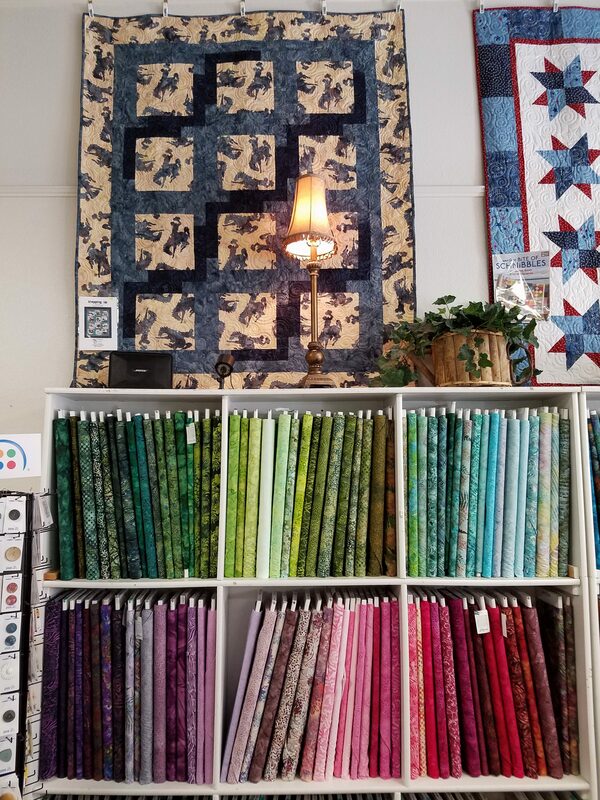 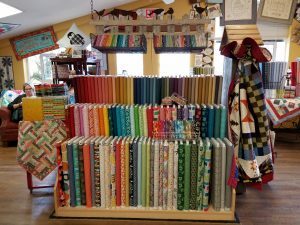 The Leavenworth Quilt Company is a small store, but they have utilized the space nicely and have a good selection of fabrics. 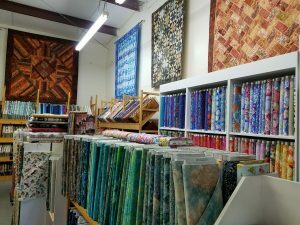 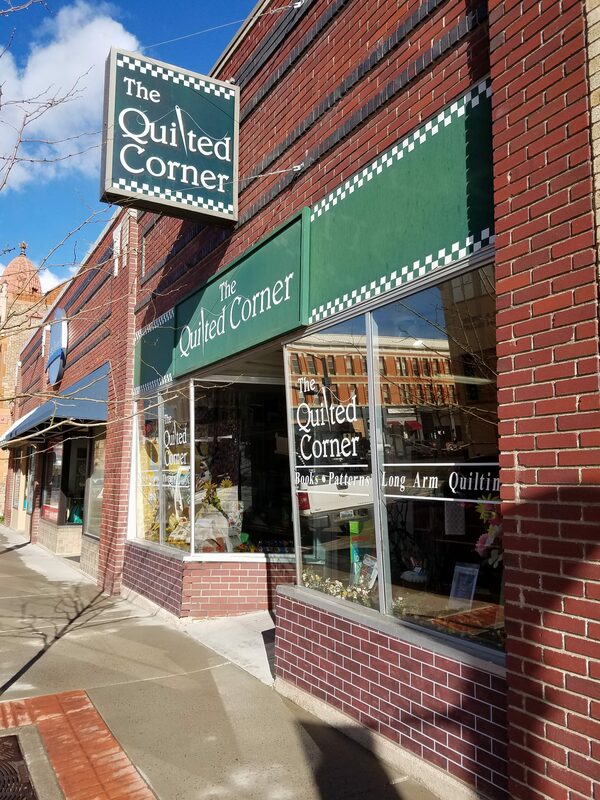 There is no quilt store in Wenatchee, so the locals are very appreciative of this store which opened its doors just five years ago. 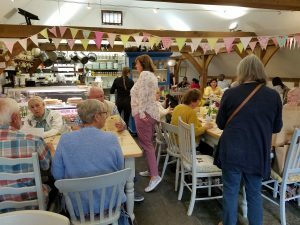 The atmosphere is friendly and it feels cozy and inviting. 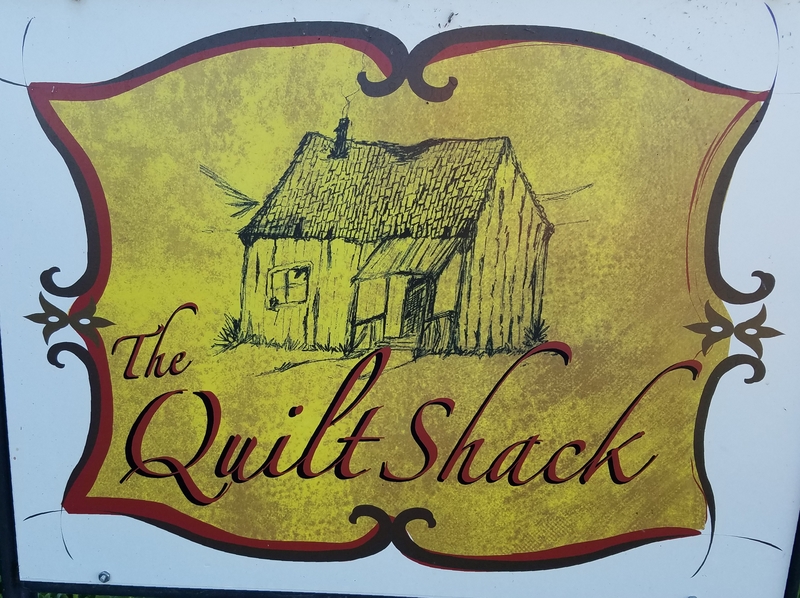 I recommend a stop there if you are passing through. 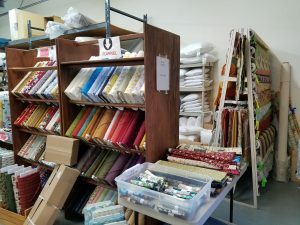 Here’s a pictorial tour. 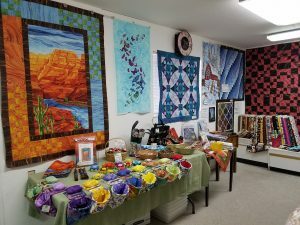 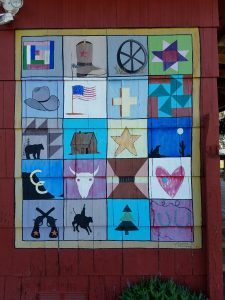 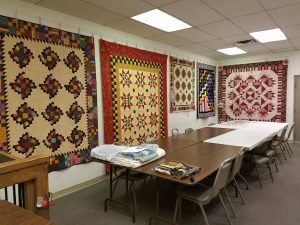 In October, I traveled to Arizona to teach at the Thumb Butte Quilters’ Guild. I stayed an extra day and two guild members took me to Sedona, where we had an incredible hike to the Devil’s Arch. 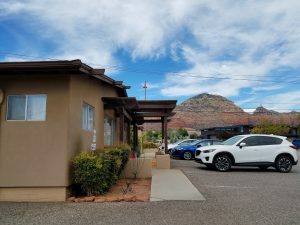 It was my first time to Sedona and I was blown away by the spectacular scenery and rock formations. 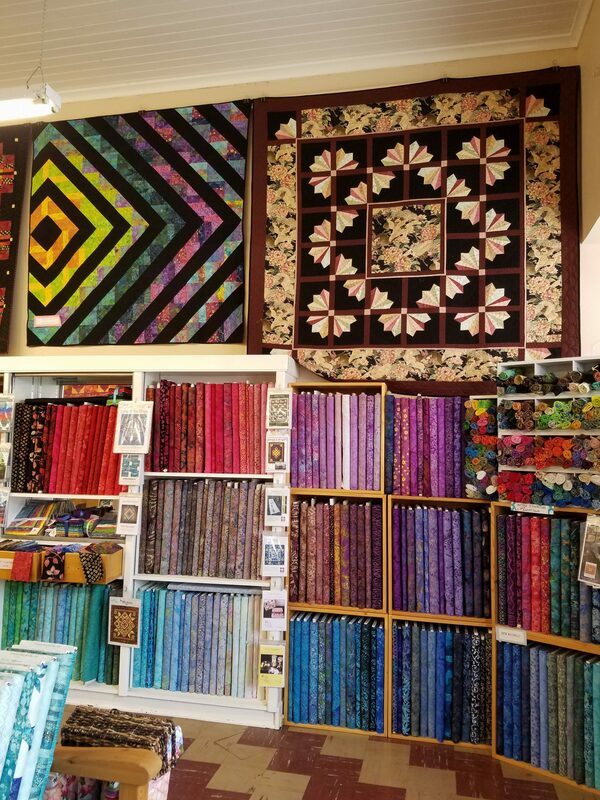 There’s always time to squeeze in a visit to the local quilt store, in this case the Quilter’s Store. 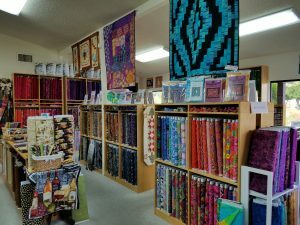 They are easy to find on State Route 89A not far from the town center. 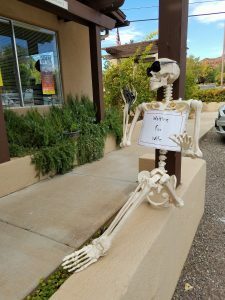 I was tickled by this skeleton sitting outside the store with phone in hand and sign saying “Waiting for wife”! 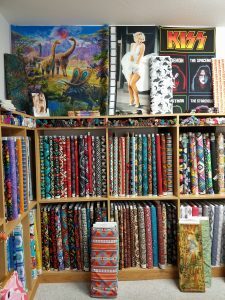 This shop is well endowed with 3,000 bolts of fabrics including around 700 batiks. 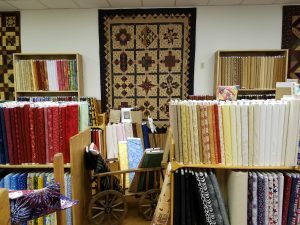 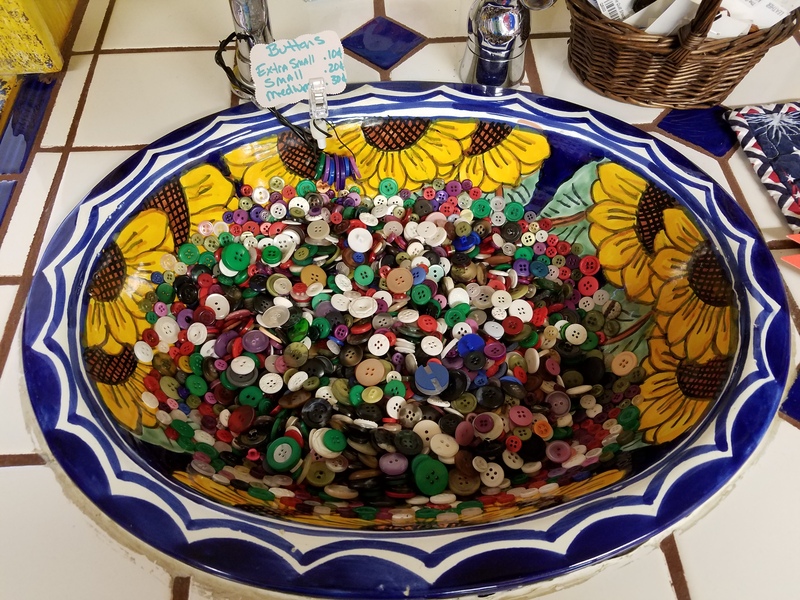 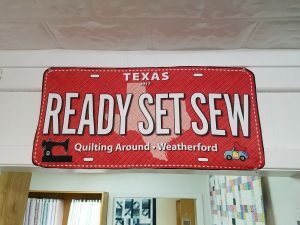 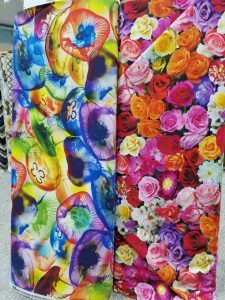 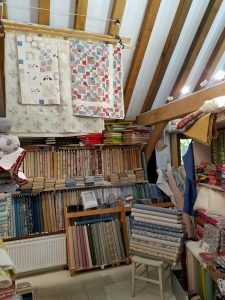 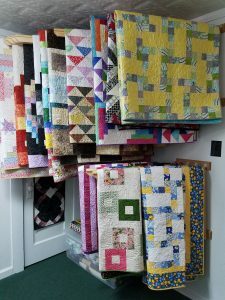 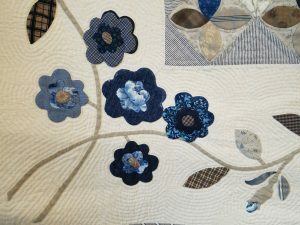 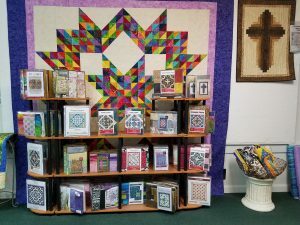 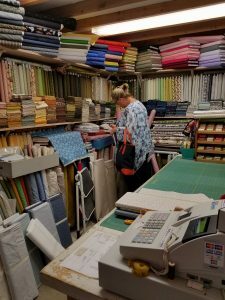 They have plenty of patterns, books and notions as well providing opportunities for quilting classes. 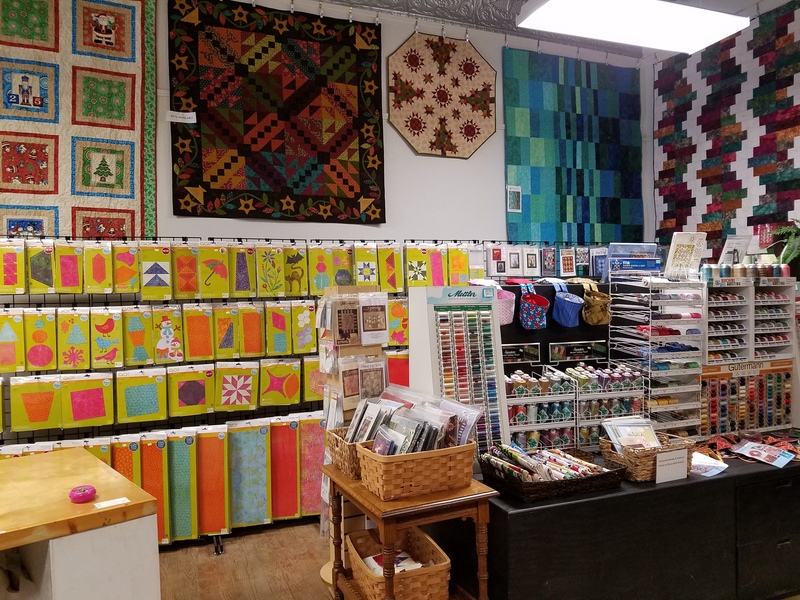 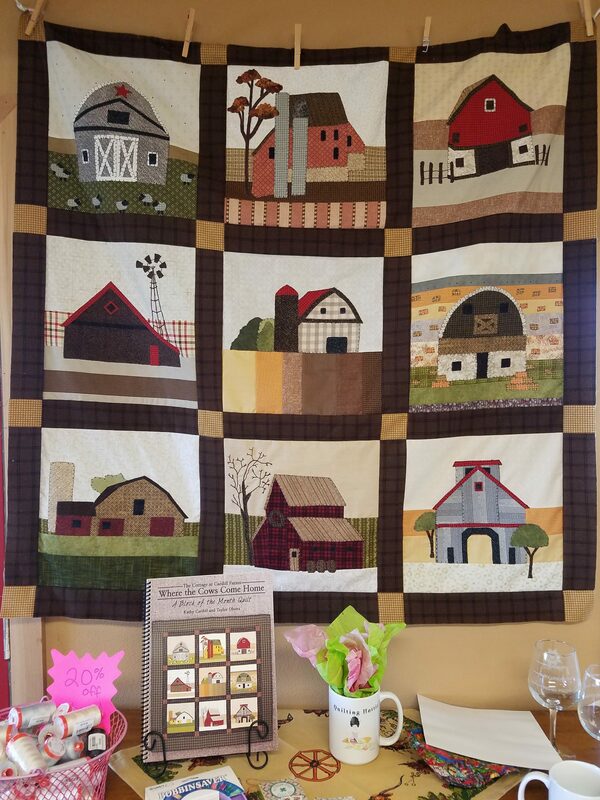 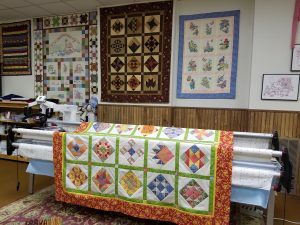 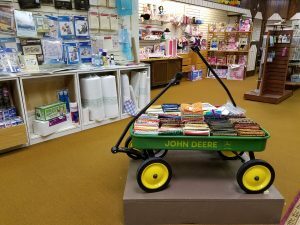 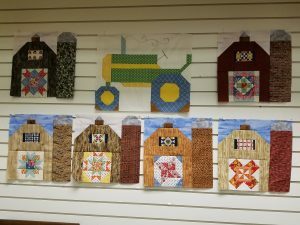 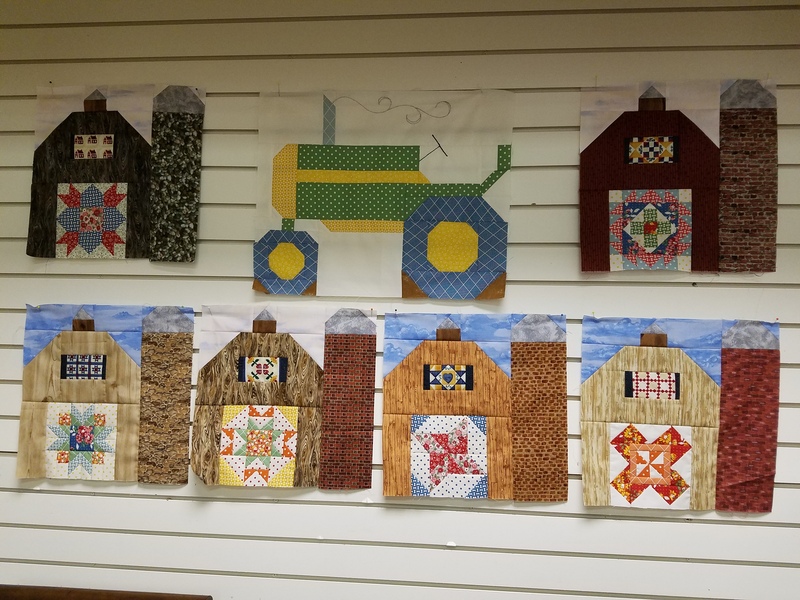 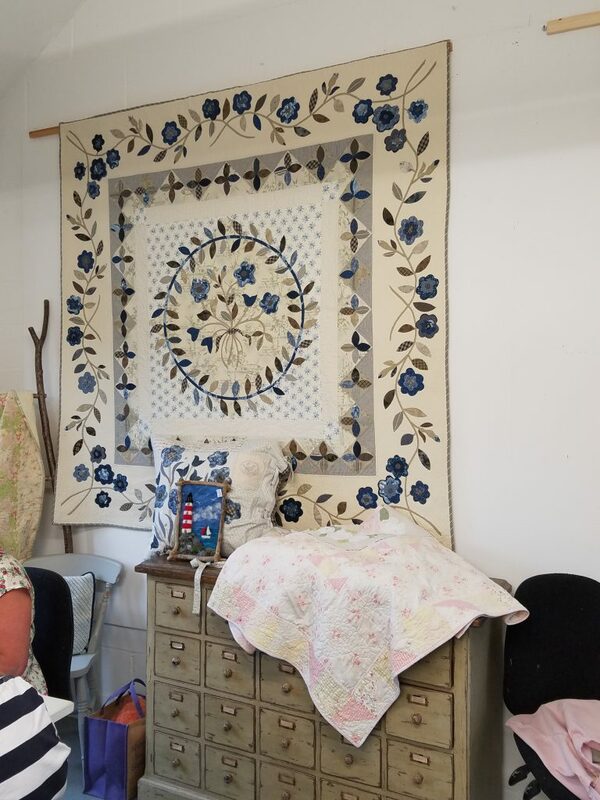 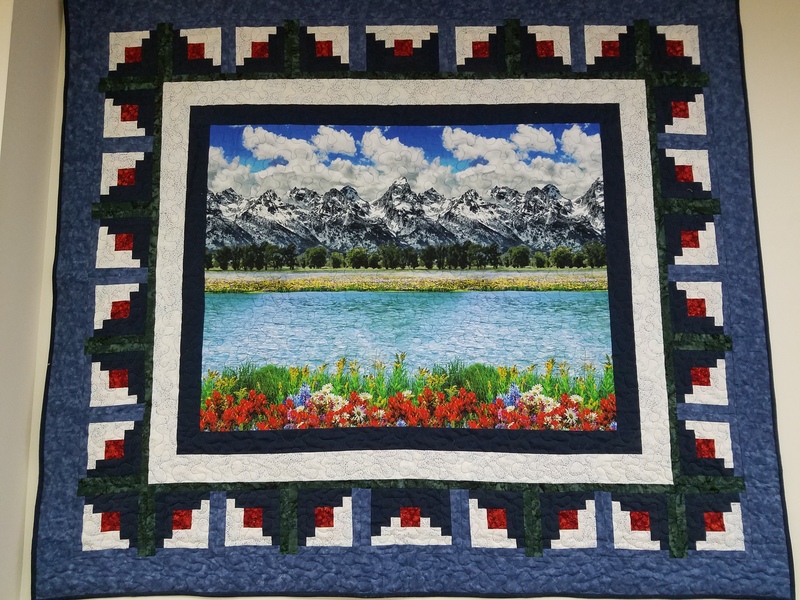 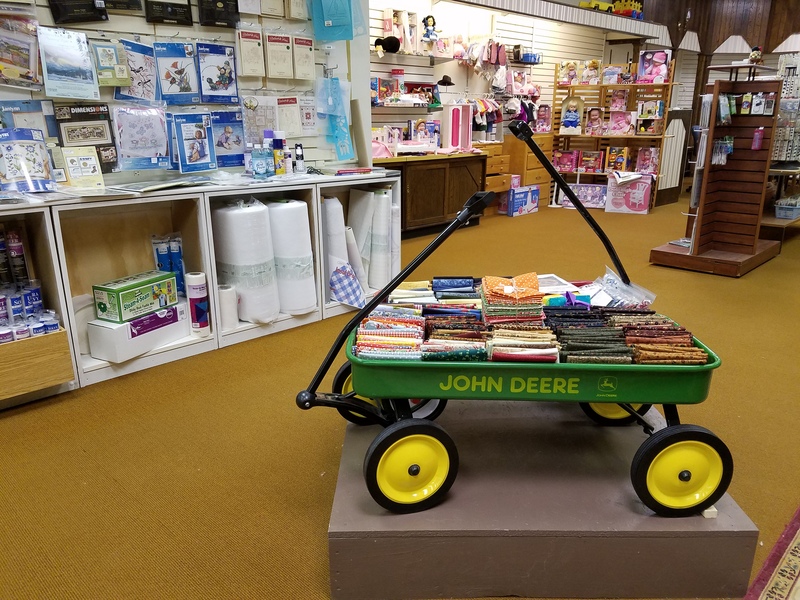 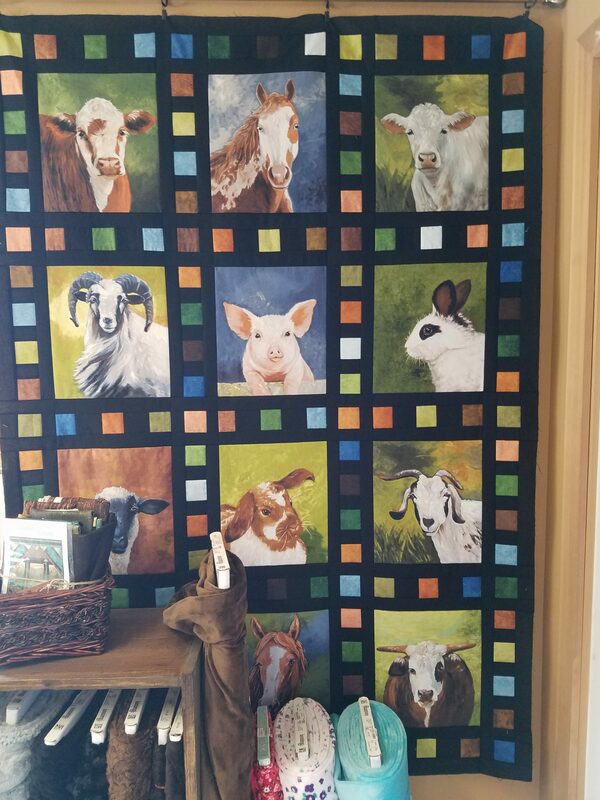 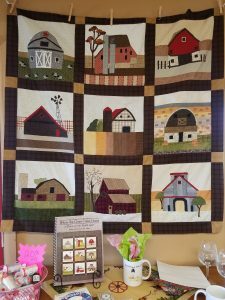 There are several rooms featuring sample quilts and a variety of products. 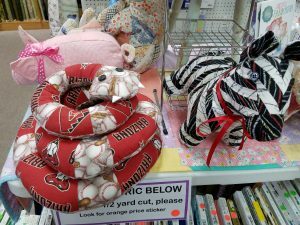 I was amused by the snake made from Arizona Diamondbacks, (a baseball team), fabric. They have an excellent selection of southwestern themed fabrics and several of the new laser printed fabrics that are really colorful. 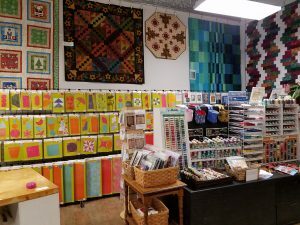 There is a gallery next door to the shop which is open for limited hours. 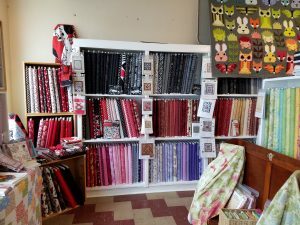 Ask at the shop and you may be able to go in there. 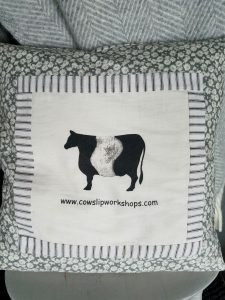 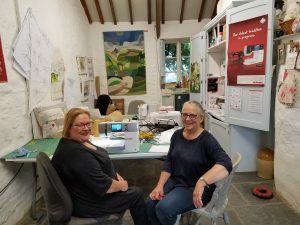 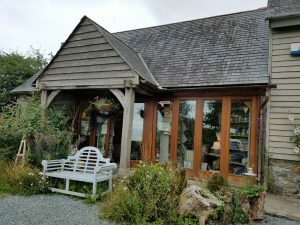 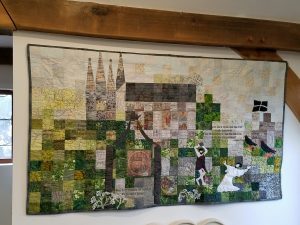 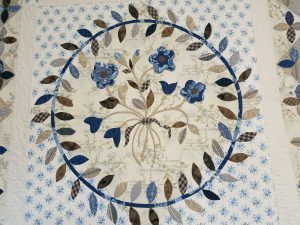 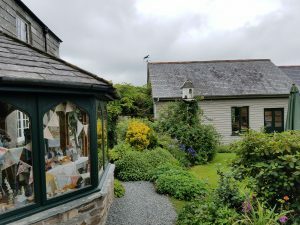 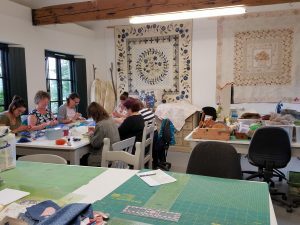 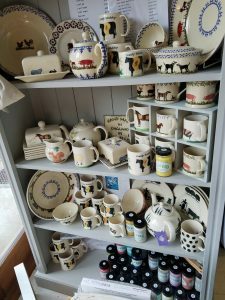 Local textile artists are featured and it is well worth a visit. 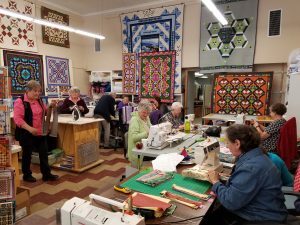 Earlier this month, I taught at the Thumb Butte Quilters’ Guild in Prescott, AZ. 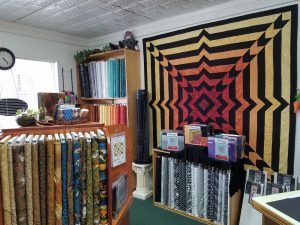 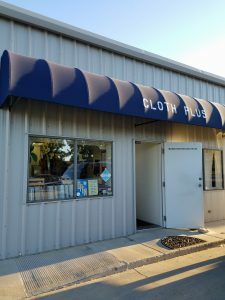 After my workshop in Prescott Valley, we visited the ClothPlus Quilt Shop, at 6497 E Copper Hill Drive. 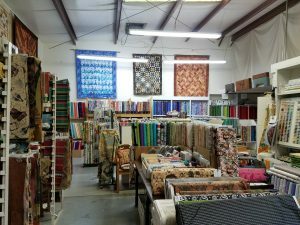 From the outside, this place doesn’t look much, but inside this industrial space there’s a great variety of fabrics and plenty of interest. 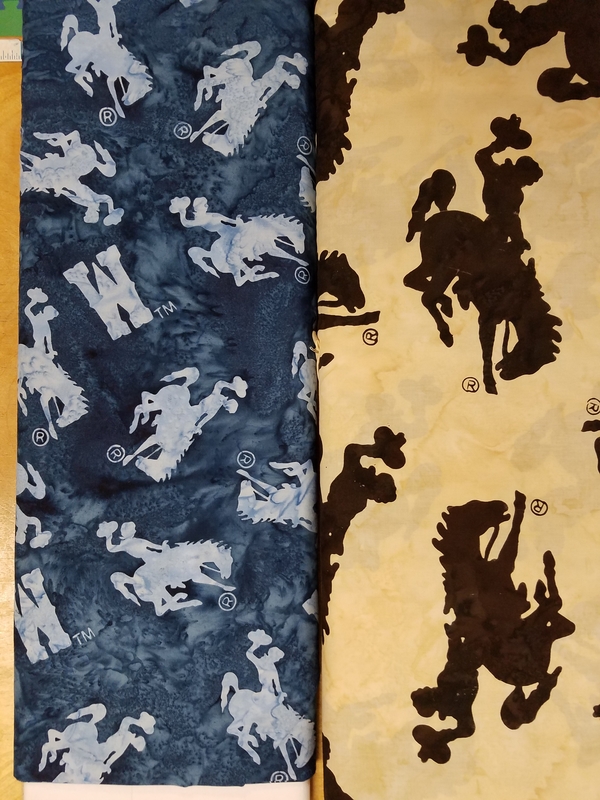 I picked up a couple of nice turquoise fabrics for my current project. 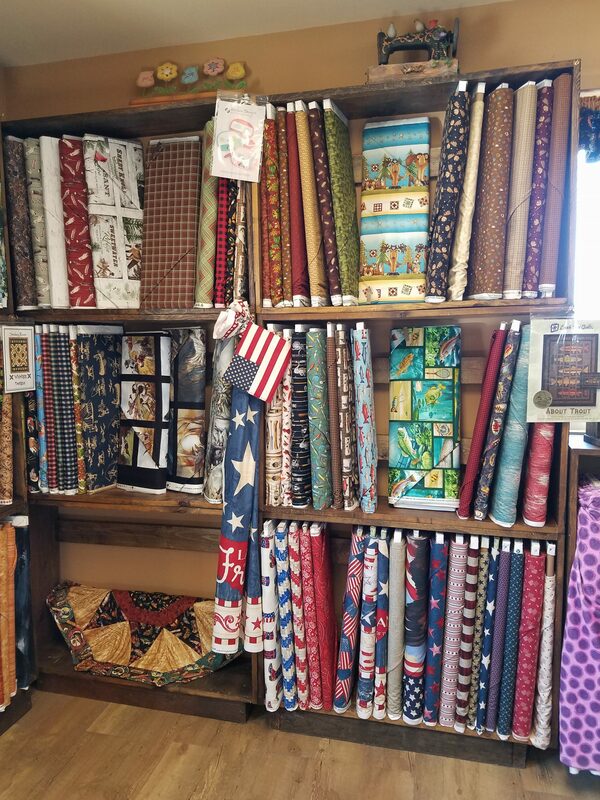 There is a large collection of batiks, some wonderful Southwestern fabrics and other theme fabrics. 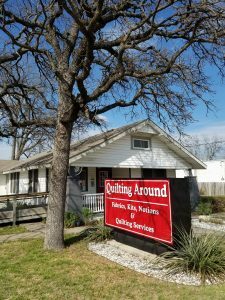 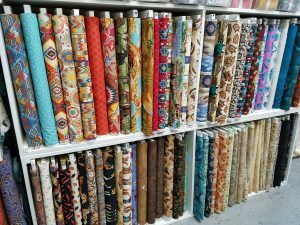 As well as an abundance of quilting fabrics and notions, they carry home decorating, auto, marine, and RV upholstery and outdoor fabrics. Here’s a visual tour. 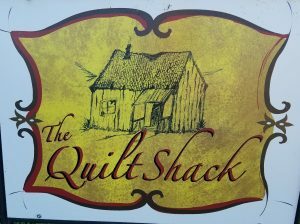 It’s worth stopping by if you are in the vicinity.